Known as one of the best fishing spots on the East Coast, the angling experience of a lifetime awaits you at Jennette’s Pier! Located in Nags Head, NC, the state-of-the-art concrete pier extends a whopping 1,000 feet out over the Atlantic Ocean. Whether you’re looking reel in your next trophy fish or spend a day browsing the aquarium exhibits, a trip to the pier should definitely be on your bucket list. 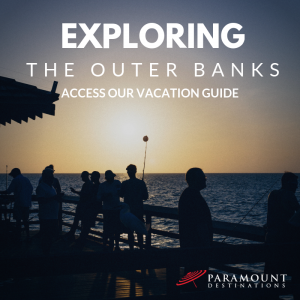 Make sure to request our free Vacation Guide for even more great recommendations about things to see and do in the Outer Banks! The Outer Banks boasts several world-class fishing spots, but Jennette’s Pier should be at the top of your list! Fishermen come from near and far to hook a variety of species including black drum, bluefish, cobia, croaker, mahi-mahi, flounder, gray trout, king mackerel, pinfish, pigfish, pompano, red drum, sheepshead, spadefish, Spanish mackerel, speckled trout, skate, and spot, among others. Come see for yourself why fishing at Jennette’s Pier has become a tradition for experienced anglers and families alike! Once you visit, you’ll want to come back year after year. Before you go, make sure to stop by the full-service pier shop to stock up on snacks and cold drinks, tackle, souvenirs, or beach supplies. It’s also a good idea to check the Jennette’s Pier surf report to see current conditions and forecast at Jennette’s Pier. Cameras are set up around the pier so you can watch live footage of the surf ahead of time. If you’re traveling with kids, you’ll definitely want to take them inside the pier house to see the aquarium. Peer into the 3,000-gallon tank and watch the colorful fish swim by, learn about the latest technology used by marine biologists to study the ocean, or submerge yourself into one of the many interactive exhibits. Make sure to take a stroll along the outer deck to see the informative displays about marine mammals, shorebirds, wind turbines, surfing, and Outer Banks fishing. From weddings and family reunions to corporate meetings, Jennette’s Pier offers a picturesque backdrop for your next special event. There is an onsite 3,500-square-foot banquet room that can comfortably accommodate 200 – 250 guests. Beautifully designed with soaring ceilings and a private covered deck, the building would be a perfect venue for any occasion. The views of the Atlantic are simply unbeatable! You can enjoy fishing at Jennette’s Pier year-round! From April to November, the pier is open from 7 a.m. until 9 p.m. From December to March, it’s open from 9 a.m. until 5 p.m. From May through October, it is open from 6 a.m. until midnight. It is closed on Christmas Day. The daily fishing rate is $14 for adults and $7 for children aged 0 – 12. If you do not plan to fish, there is a $2 fee for adults and a $1 fee for children. Rods are available to rent for $10, or you can rent a pin rig for $8. The pier also sells multi-day passes and annual passes, the latter of which includes a free family membership to the aquarium. Once you’ve reeled in the catch of the day, come relax and unwind in one of our Outer Banks vacation rentals! Located in Corolla, Duck, and Southern Shores, our properties are just minutes from the best Outer Banks fishing piers. From intimate cottages to large beach estates, we offer an extensive selection of homes. We even offer pet-friendly accommodations for guests who are traveling with their four-legged friends! If you’re looking for rentals close to Jennette’s Pier, Memory Lane in Nag’s Head is an excellent choice. With a large wrap-around porch, top-notch amenities, and incredible oceanfront views, this stunning beach cottage is just a 6-minute drive from the pier. Are you ready for the fishing experience of a lifetime? Check out our current specials and book your stay today. We look forward to welcoming you to the Outer Banks!